UCCS is the most affordable school in the CU campus despite an increase in tuition costs. According to the Director of Institutional Research Robyn Marschke, for the 2018 school year the average tuition for a full time undergraduate student taking 12 credit hours is around $9,248, an increase of about 2.8 percent from last year. The Office of Institutional Research, part of the Administration & Finance unit at UCCS, measures the affordability of campus by collecting and analyzing data related to student success, institutional effectiveness, faculty productivity, student learning and other performance indicators. At the same time, the Board of Regents is responsible for determining and approving actual costs and fees in March or April according to Marschke. Marschke said that the annual tuition drafts are available on the Institutional Research’s website as a free resource. Factors for tuition estimates include residency classification, program/course fees, mandatory fees, service fees and housing expenses. The College Opportunity Fund (COF) increased to $85 per credit hour for Fall 2018 from $77 in Fall 2017, according to Marschke. 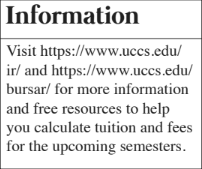 Marschke encourages students are also encouraged to use the Student Financial Services detailed bill calculator, located on their website, to assist in calculating their average cost of attendance for any given semester. Compared to other public four-year institutions in Colorado, the cost of attendance at UCCS is relatively less. “Generally speaking, UCCS has smaller tuition rates than those of Denver and Boulder. Two thirds of UCCS undergrads apply for financial aid, and that ratio is a lot smaller on the Boulder campus,” said Marschke. She says that students who attend more expensive schools likely come from families who can afford the higher tuition. According to College in Colorado, the average in-state tuition of other CU campuses for students taking 15 credits hours are all upwards of $11,300. 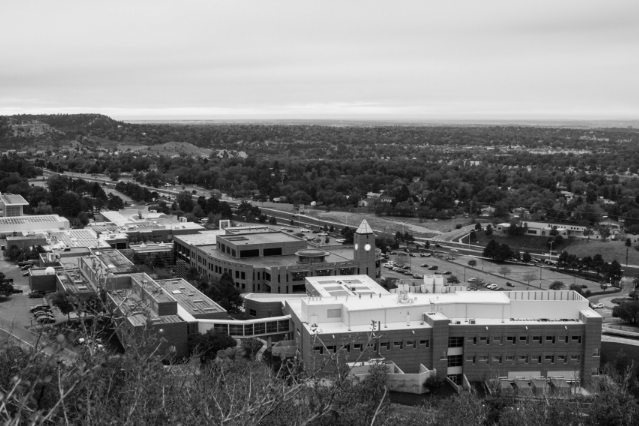 As of recently, the Board of Regents held a meeting on Oct. 2 to further discuss affordability and measure its impact on both current and future students at UCCS.